A Toronto racetrack dedicated an evening of races to more than 40 horses that died in a barn fire southwest of the city earlier this week. Woodbine Racetrack began their Thursday evening tribute with a video presentation, followed by a minute of silence. The track said the flags on the property would be lowered to half-staff when the races finish. The evening tribute honours 43 horses that died in a fire in Puslinch, Ont., on Monday night. 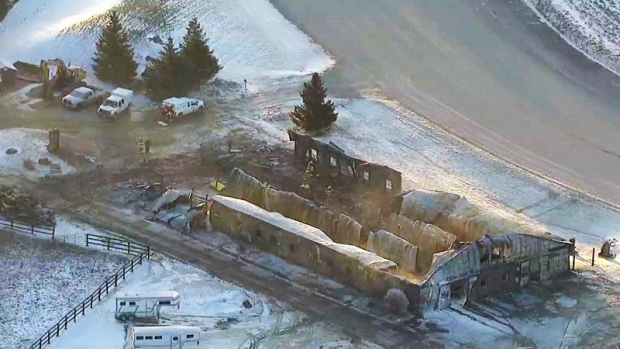 The fire tore through one of five barns at Classy Lanes Stables Training Centre, located in the township approximately 20 kilometres southeast of Guelph. The majority of the horses housed at the facility are owned by trainers, who race them at southern Ontario racetracks including Woodbine, the Mohawk and Flamboro Downs. "As a horse person, I can imagine how difficult a time it is for those that lost horses, who are like members of the family," Woodbine Entertainment Group CEO Jim Lawson said in a statement Thursday. "It is heartbreaking. Our deepest sympathies are with everyone impacted by this tragedy." As crews work to dismantle the scene, hundreds have contributed to crowdfunding sites set up to help the owners and trainers affected by the fire. One of the sites, set up by the Central Ontario Standardbred Association, had raised approximately $118,000 as of Thursday afternoon.